This is a cloud image of my dissertation (without footnotes but with bibliography) with the most important words. 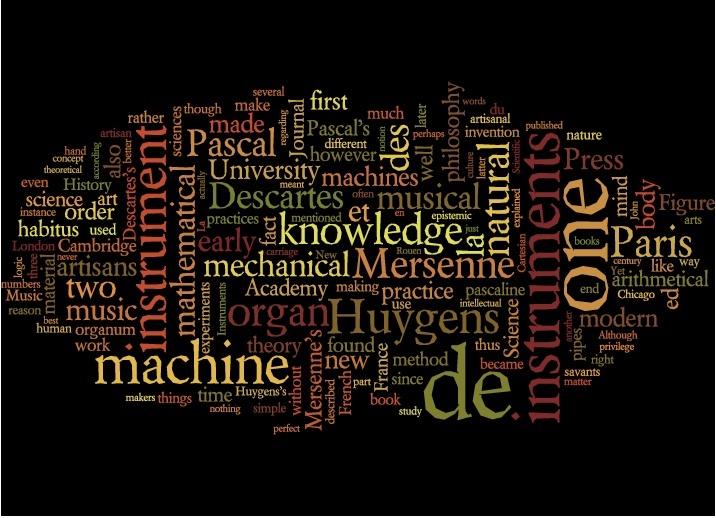 Unsurprisingly, “instrument”, “instruments” and “machine” dominate the field of view. You can do your own on the wordle website. I owe this link to Alex Wellerstein. I am currently the Director of Administration / Lecturer for the Collection of Historical Scientific Instruments (CHSI) at Harvard University. Before returning to Harvard, I was between 2009 and 2011 a Mellon Postdoctoral Fellow at McGill University in Montréal (Qc). That Fellowship followed a full-time position as a Curator for the CHSI at Harvard. For the past 10 years, I have studied instrumentation from the 17th to the 20th centuries. For my dissertation (Harvard, 2008) I focused the research on the relationship between artisans, savants and machines in early modern France. The dissertation is entitled Habits of Knowledge: Artisans, Savants and Mechanical Devices in Seventeenth-Century French Natural Philosophy. Since 2000, I have co-written and co-edited two prize-winning volumes as well as several articles and book reviews dealing with instruments and instrument making.